I decided to leave work early yesterday in part to combat my jet lag and in part because I was dying to go home and cook dinner after eating out for every meal for 9 days. 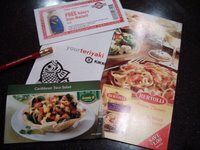 I stopped at a Raley's for the ingredients for dinner and because it was part of the What's In Store promotion. I am glad that I had low expectations yesterday when I decided to go because those low expectations were certainly met. There wasn't even any free soy sauce. Darnnit! They had a little flyer posted in the window (and I received a post card in the mail), so when I entered, I had a few seconds of eager anticipation. 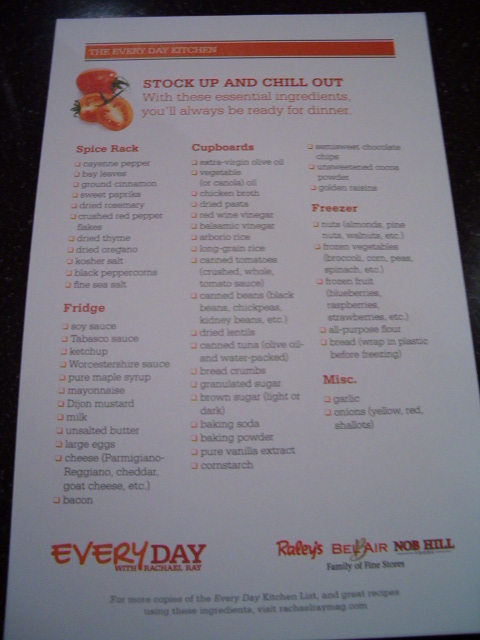 Then I walked through the store, looking for the vendors sharing the products from Every Day with Rachael Ray and ... I didn't see any. I finally made it back to the front of the store where saw a woman standing in a EDRR hat. Victory! Except all I got was a taste of new Pepsi flavors and a super cute red gift bag with the EDRR logo on it. The bag had coupons and a little red EDRR pencil inside, pictured above. 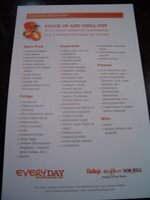 The thing that made the trip out of my way worth it was the Every Day Kitchen list. It is on thick cardstock and now has a coveted place on my fridge! So all was not lost. And I learned I don't like Black Cherry Vanilla Pepsi.